FILE - A woman removes plastic waste stuck in tree branches near the beach in Thanh Hoa province, Vietnam June 4, 2018. More Vietnamese than ever are looking for alternatives to plastic, from metal bottles to cloth tote bags, just as many communities around the world are starting to believe they have relied for too long on cheap and versatile -- but ecologically disastrous -- plastic. Rwanda was remarkably efficient at banning plastic bags, while Durham, North Carolina has a volunteer program to distribute reusable takeout containers, and an Amsterdam grocer introduced an aisle of products with no plastic. 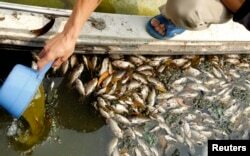 An environmentalist checks the quality of the water near dead fishes along the Ngoc Khanh lake in Hanoi April 25, 2011.